Sometimes we forget that not everything we do is original, unique or never-before done. Here’s a case in point from the world of needlework research, presented as an example that we are not unique, and as a mildly cautionary tale. There are hundreds of folks out there delving into the historical needle arts – some to research and re-create the techniques, some to make investigation into the aesthetic, artistic, or symbolic aspects, and some to profile the creation and use of artifacts within their social and cultural context. We are not the first to do this. I have stumbled across an article from June 1909, written by Kathrine Sanger Brinley, published in The Craftsman magazine – a product of the Gustav Stickley Arts and Crafts movement (and his commercial empire). That issue of The Craftsman is available on-line as part of the Digital Library for Decorative Arts and Material Culture, maintained by the University of Wisconsin. Her description is rather florid, although it is in keeping with the philosophical bent of The Craftsman. 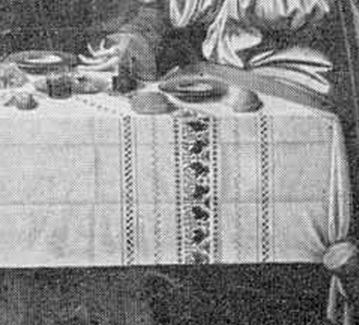 She concentrates on the embroidery on the tablecloth, and provides a black and white photo that appears to reveal slightly different detail of those panels than do modern photos. On the left is a snippet from her photo, on the right, a snippet of the original daVinci, as found on Wikipedia. Brinley discusses a copy of the work, done by d’Oggiono, in the collection of the Louvre, but does not directly identify that copy as her source. D’Ogginio is considered to be one of daVinci’s personal pupils. I do not see a copy attributed to him listed in on-line sites detailing the original painting, nor do Louvre on-line searches turn it up, so I do not know if current scholarship still recognizes the piece. Whether or not this piece has been discredited or lost, I can’t determine. I am no art historian, so I can’t say when in history Jesus’ feet were replaced by a door lintel. I can only observe that there are many more differences between the two than the presence of feet. In just this little snippet, the side figural band appears to have migrated from one side of the bread roll to the other. The modern photo also indicates the presence of a few more bands of patterning than does hers. Brinley plunges full ahead with the assumption that the tablecloth’s patterning is embroidered, not woven, and attempts a reproduction of the design. Now to my eye, it’s more probable that the cloth shown was inspired by Perugia style weaving, and that it was not a depiction or conjecture of an embroidered textile. But let’s set that aside, too. She posits a counted thread technique for the bands, due to their linear character (also an artifact of weaving), and cites the prevalence of cross stitch in Italian embroidery history. She concludes that the piece was originally worked in cross stitch, stroke stitch (aka double running), and point Lance (short, straight stitches); also double Italian cross stitch (which she calls out as double-sided cross stitch). She gives a drawn diagram for the design, and displays her own flat frame, with its in-process snippet. Interestingly enough, while she cites the work as being counted, her own renditions are not. They’re penciled onto the ground cloth and stitched free of count. Having graphed over a hundred patterns of this type myself, I can say that if in fact the original was embroidered, Brinley’s chart is a probably a vast simplification of what the original design might have been. Even if the original was woven, how it is shown in the painting is not a photographic depiction. It is another victim of the fidelity and resolution that results when a fine stitched or woven piece is rendered in paint – especially when that detail is not central to the composition’s central subject. What we’ve got is a historical-historical embroiderer, bent on re-creating a pattern from what she believed to be a period artifact, and making an assumption that the original was stitched and not woven; and that the fidelity of the source painting was true. She went on to suppose that the piece was produced using methods contemporary with modern stitchery (informed by some historical examples). She created an eyeballed redaction inspired by the artifact and presented it as accurate; then rendered it using her own methods. Is her chart faithful to daVinci’s original? I can’t say. Obviously, I am leaning towards a Perugia-style tablecloth and not a stitched one. I’m also not inclined to accept her design version as accurate. But I can say that I feel for her efforts, respect her attempt, and hope to avoid her pitfalls in my own redactions of other works. A great article, thanks! Makes me wonder how many generations of copies Brinley’s source was from the original. All praise to you, and to Brinley, and all other researchers who attempt to extract designs and techniques from such imperfect records as paintings. 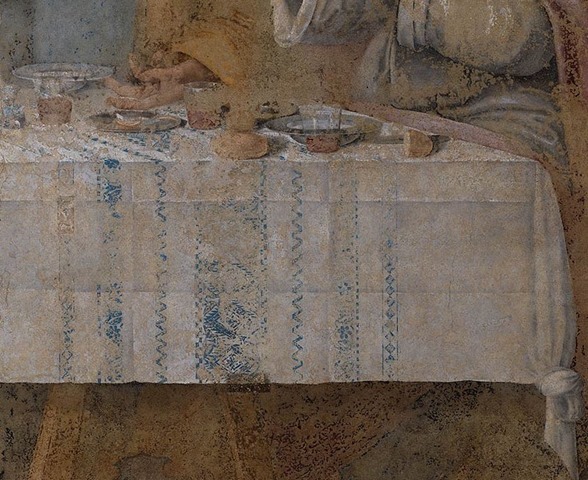 I agree that the tablecloth in the painting is likely woven — that would have been utterly appropriate for Da Vinci’s time. One wonders if the Perugia weavers thought they were re-creating an older style as well, given the Renaissance interest in Classical art? Curiouser and curiouser….